The Friends of the Sacramento River Parkway organized the Sacramento River Parkway Coalition as an association of groups and individuals who want to see the completion of the Sacramento River Parkway from Sutter County to Sacramento's southern city limit. 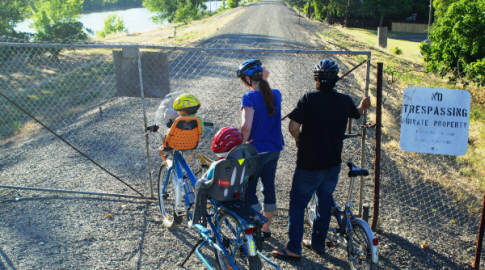 The Parkway is an on-levee multi-use trail and its related parks and amenities, but it has been stalled for almost forty years by a relative handful of homeowners who claim rights to block all public access to "their" levee in the Little Pocket and Pocket neighborhoods. Coalition members are committed to convincing officials and agencies that public sentiment overwhelmingly favors access to the levees - not just for the recreational and alternative transportation opportunities that an uninterrupted Parkway will provide, but also for the elimination of private fences and gates that exacerbate the chances for a catastrophic flood, increase costs of levee maintenance and operation, and delay flood fighters from responding rapidly during high flows in the river. The Friends of the Sacramento River Parkway monitors the agendas of public bodies that oversee our levee, then alerts Coalition members when officials will be considering actions that affect the Parkway's future. Coalition members will help us convince public officials that the overwhelming majority of area residents want access to our river - and the elimination of unnecessary threats to flood safety. While we believe that private fences and gates must be removed to reclaim the public's rights and to eliminate flooding risks, we also believe that the Parkway's completion is not inimical to private property rights. The City of Sacramento can develop the Parkway in ways that will minimally impact adjacent homeowners, and that improve their security by improving patrol and response by fire, police, and park rangers. The Coalition does not speak with one voice, but it speaks through the multiple voices of its members. Members may have differing views about the best route to completion of the Parkway, but we all believe it must be done. ABOUT THE PEOPLE IN OUR SACRAMENTO RIVER PARKWAY COALITION PHOTOGRAPH - Elle and Jose Bustamante volunteered to be the models for a photograph that would put a face on the issue of access. Their story, chronicled in an ongoing blog, is amazing. They're going car-free and sharing that experience with all who care to read it. Check out their blog at www.tinyhelmetsbigbikes.com.